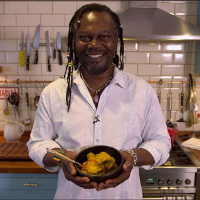 The Dragon Slayer, Levi Roots, shares his recipe for Puerto Rican Chicken and Rice inspired by his Grandma’s traditional “One Pot, One Love” style of cooking. 1. Wash the rice lots, until the water runs clear, roughly three times. 2. Season the chicken with the all-purpose seasoning, salt and pepper. 3. Heat the oil in a frying pan and brown the chicken on all sides. 4. Remove the chicken from the pan, add the onion, peppers and garlic and saute until the peppers soften. 5. Add the allspice, turmeric, ginger and chilli and cook for a minute longer. 6. Put the chicken in a casserole dish, big enough so it can all fit in one layer. 8. Pour the rice round the chicken, add the stock, thyme and bay and season well. 9. Oven cook for 40 minutes at gas mark 5/6, no need to stir or anything like that. 10. 15 minutes before the end of cooking time, add the olives.